Things Your Grandmother Knew: Living The Viva Vintage?, Or Just Plain Loco? "It's true that some of us have overly romanticized the 1950s (or any era, really); but some of us have demonized the past as well. 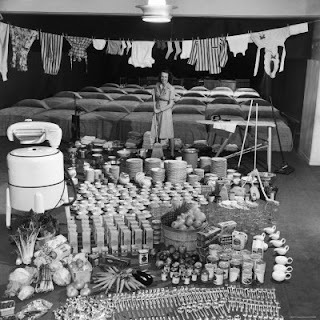 In the process, we've thrown the baby of helpful household tips out with the bathwater of modernism and/or feminism. This "either or" or "all or nothing" thinking has diminished the value of housewives and housework, and, in my opinion, many of the so-called conveniences are anything but -- they've only raised other economic, environmental and health problems, for individuals and our country as a whole." An incredibly cogent point that you have articulated much more clearly than I have been able to in talking with people. One thing I haven't seen any discussion on is this. How aspirational were all this housewifery books and magazines targeted at women. Fifty years from now will people be looking at Martha Stewart and Real Simple and InStyle and any number of other magazines and books and blogs and websites and take them as a literal representation of life today? Well said, Pop Tart and Gracie! I was sort of amazed at the wealth of good information and advice I found while doing the experiment - much of which has all but been abandoned (even more so when it comes to advice out of wartime Britain - I collect homemaking guides from that era as well). I've wondered the exact same thing, Gracie, as to how we'll be judged based on our current media and what impression of us it will leave on future generations. I hope that those who stumble across my experiment, realize that I was "going by the books" (magazines, books, etc.) and that those were highly idealized versions of what women were expected to do - and not how I imagine every woman of the time living. Anyway - love your blog and thanks for the interesting discussion! Actually, I was thinking the same thing the other day when I was at the grocery store, staring at the house & home magazines in the checkout line. My life sure doesn't look like Martha Stewart Living. While I think it can be very interesting and informative to draw comparisons between now and the 1950's (or insert past era of your choice), I get tired of them making judgments. It was what it was and we can't do anything about it now, except hopefully learn to do better. I hope none of us leads a truly vintage life because there are a lot of authentic viewpoints that don't need to be resurrected/encouraged. I'm content to settle for a lot of vintage aesthetics, while holding onto the advantages of the modern era. Yes, that may be superficial, but sometimes that's as far is it needs to go. Thank you ladies for chiming in on this! As a collector of vintage magazines and other publications (among many things lol), the unrealistic aspirational quality varies -- as it does today. Over all, women's publications are the worst; the men's at least are obvious and almost comical in their stated belief system, while those publications supposedly "for" women often seem the most against them. However, that doesn't mean they are worthless. Be it the odd tip, great interview, etc., they also offer a starting point for discussions of media, female identity, etc. More on that at my other blogs, tho. I look forward to reading more at each of your sites! I just found your blog, and I have to tell you that I really appreciate this post. I like to talk on my own blog about how our perceptions of history, both the good and the bad, are often inaccurate. There's much to be gleaned from history, and I very much enjoyed reading several of the household tips you've offered in nearby posts. On the other hand, though, we can't look at history and assume that it was always pleasant. Truthfully, many parts of history were quite difficult and rather unpleasant, and I'm glad that I didn't live through them. On the other hand, though, there is much of benefit that we can learn from the past as well.